Elevating a cannabis clothing brand that represents the rights and privilege that we as a cannabis community have to fight for the freedom to smoke marijuana "without fear or prejudice"
Are you willing to represent without fear or prejudice? ​We have here our signature selection of weed t-shirts, hats and hoodies. All of our screen printing and designs are created and done in house with the utter most care here in our Santa Rosa CA location. We take special care and pride in every aspect of our company and what we push out to our customers. We hope you join us and our movement to fight to end the stigma surrounding marijuana by wearing and supporting a new cannabis apparel company brand. Even if its not us! Now lets PAK-DAT "without fear or prejudice"
These are the first two designs we created to represent our company and our company logo. 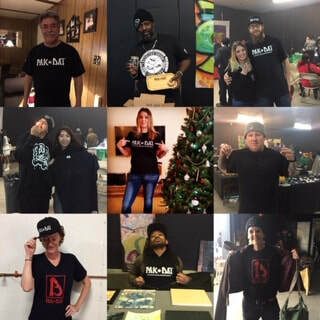 Since launching our cannabis movement apparel company back on April 20th 2018 we have met and talked to so many wonderful people within the cannabis community the out reach and support has been truly amazing. With every event, festival street fair and cannabis convention we've attended the response has been over whelming and the love has been truly felt. What we have here is a collection of cannabis movement supporters. 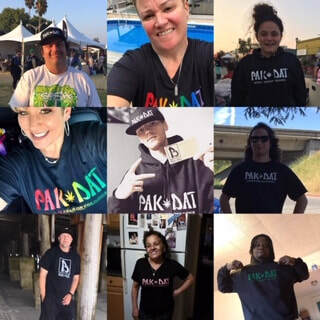 While we have been slowly growing our customer base and expanding our cannabis apparel movement we've started a photo gallery of our cannabis community family representing PAK-DAT apparel "without fear or prejudice"
​If you would like to be featured in our next up and coming gallery please email us your picture or using www.instagram.com/pakdat420 just #pakdat420 or @pakdat420 and we'll be happy to upload your pic to be part of the growing cannabis family. No better feeling than finally being able spark up. By incorporating the two elements that bring us together as a cannabis community. The infamous weed bowl on top of are PAK-DAT logo. My journey began! As a Connecticut native pursuing art and fashion. My inspirations were always drawn to create cannabis art. To ensure that we fight to end the stigma associated with the marijuana plant. I intend on combining my love for cannabis art and stoner fashion. By bringing you a cool and calm feel good 420 lifestyle clothing brand. That represents the freedom to PAK-DAT420™ without fear or prejudice.
" 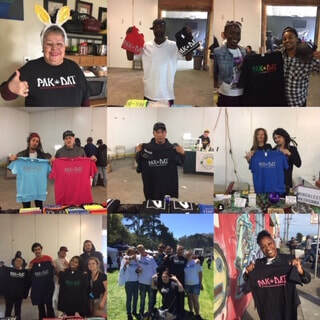 With the love for art and cannabis it brought me to create PAK-DAT420™ apparel. By combining my love for art, fashion and cannabis. 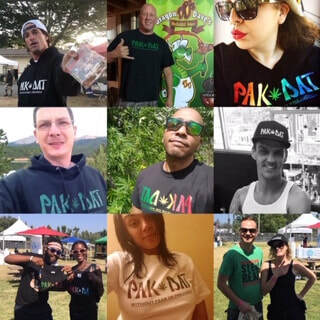 I intend on creating a stylized apparel brand with a message to tell your friends to be the first to call out PAK-DAT! Sign up for great deals and to hear about new products!